The first thing you need to do is wake Fiete and his friends up. I am a fan of Fiete. He’s funny and expressive; I still remember when I played against him in Fiete Match. Today, I want to highlight his latest app called Fiete - A Day on a Farm. It’s a fun way for kids ages 3+ to learn about the activities that are typically performed in a farm from sunrise until sunset. Each activity in the app is accessible through the circle icons on the farm map. 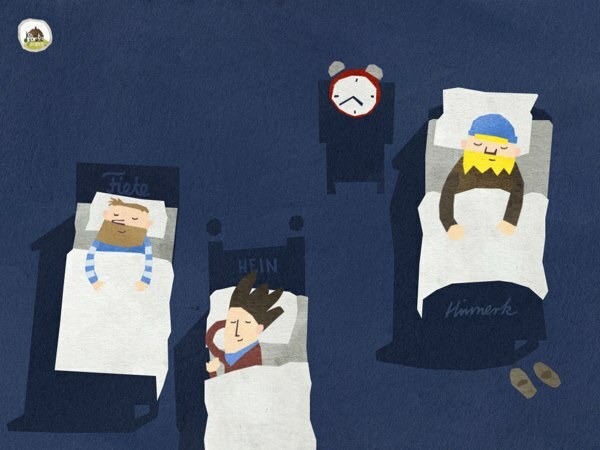 The first circle leads to the bedroom where Fiete and his friends, Hinnerk and Hein, are sleeping soundly. Your task is to wake them up by tapping each character repeatedly. Once awake, Fiete and his friends are ready to start their daily routines: collecting eggs and harvesting carrots. To help them, simply drag the eggs and carrots to the hands and bucket. As you scroll to the right, you will notice that the sun has risen up to the center, indicating it’s around noon. Three activities that can be performed at these hours are cleaning the pigs, picking up the apples, and shearing the sheep. When the sun sets, you can milk the cow, feed the pigs with corn, and have the merchants pick up what your farm has produced that day. The merchants will come one at a time, and you need to match the merchant truck with the right produce. Your farm products include the eggs, carrots, apples, wool, milk, and grain. Fiete - A Day on a Farm is a fun way to introduce the farm life to our kids, especially if you live in an urban or metro area. If your kids have enjoyed Fiete’s previous apps, they’re going to love playing with Fiete and getting to know his friends in this app. Even though the map is laid out chronologically from morning to evening, you can actually play the activities in a random order. You can move back and forth in the timeline, and replay any of the activities that you want for as many times as you like before moving to the other activities. Note: At the time I write this review, the developers have acknowledged a crashing problem with older devices, such as the iPad 2. I also experience a couple of crashes on my iPad mini. The main reason is the lack of available RAM in these devices. The developers are working on an update that will reduce the required memory footprints allowing the app to work perfectly in older devices. In the mean time, you can close all other apps that are running in the background to free up as many RAM as possible. At the end of the day, load what your farm produces to the correct merchant trucks. As you’d expect from Fiete, you’re going to see a lot of humor in the app. For example, you can’t really use the alarm clock to wake Fiete and his friends up; instead, you need to tap them repeatedly. You can also switch the order of the person you wake up first to identify who is snoring the loudest. Another silly example is when Fiete climbs up the apple tree to pick up some apples, you will see Hinnerk trying to cut a branch by sitting on the part that will fall. The app is very intuitive. It doesn’t include written or audio instructions, but the mini games and activities are very straightforward. Personally, I really like the way you move from sunrise to sunset. Scrolling the map shows the sun movement and what each character are doing during those times of day. This app has the sense of humor you’d expect from Fiete apps. Fiete - A Day on a Farm consists of nine different activities that are commonly performed on a farm, dispersed across the day. As you can expect from Fiete, there is plenty of humor to go around. The app is also quite intuitive, so younger kids can play on their own even with the absence of text and voice-over instructions.